A great number of cases which I handle involve representing either a business owner or the spouse of a business owner. In these cases, working with the attorney for the business can be crucial. My friend of many years (and law school roommate) Sandy Swartzberg of the law firm Weiss Berzowski Brady LLP represents businesses. So, we thought it might be interesting to co-write an article on the business divorce. 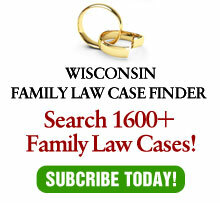 Our article appears is the cover article in the January, 2014 issue of the Wisconsin Lawyer, the main publication of the Wisconsin Bar Association.